This important health study shows the profound effects of Ba Gua Zhang practice in preserving health in the elderly. Conducted by the Beijing Ba Gua Zhang Association in 1990, the study reviewed the effects of Ba Gua Zhang practice on health and longevity. This article was published in Martial Arts of China magazine. 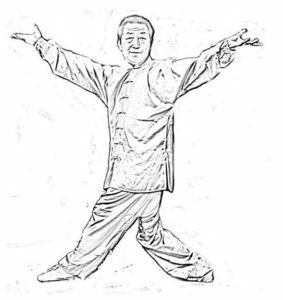 Ba Gua Zhang (Eight Diagram Palm) is a Wushu form with a relatively short history. Apart from its combative value, Ba Gua Zhang has proven to be an effective means of preventing disease and promoting health and longevity. For this reason, Ba Gua Zhang has gained widespread popularity among the Chinese people. In order to make a medical and physiological study of the health-giving effects of Ba Gua Zhang, a comprehensive research group was formed by 13 members of the Teaching Groups of Sports Physiology Wushu, Sports Medicine and Anatomy at the Beijing Physical Culture Institute. Their research program involved 60 males ranging from 60 to 82 years of age who were divided into two groups: (1) the exercise group of 30 persons who practice Ba Gua Zhang regularly; and (2) the control group consisting of 30 healthy retired workers. They were given X-ray photographic examinations of the chest, waist and hips, as well as a number of medical physiological tests in such items as range of movement of the spine and hip joints, breathing function, circulation function the work capacity of muscles, eyesight, hearing, balancing ability and circumferences of the limbs. Statistical treatments with BCM II type electronic computer of the data obtained showed clearly that the exercise group is better than the control group in all respects. This amply proves that regular practice of Ba Gua Zhang can promote health and slow down retrograde changes related to senility. The basic Ba Gua Zhang movements consist of walking around in circles. By doing so, the limbs are subjected to continuous exercise in extension and flexion, adduction and abduction, which helps improve or maintain the range of the joint movements. Movements of the joints over a large range and in various directions within the anatomical limit causes repeated stretches on the distal points of the corresponding muscle groups on the bone surfaces and around the joints. They also speed up substance metabolism, activate the osteoblasts, improve blood supply to the bones and promote adaptive changes of bone structure. The following comparisons were made between the exercise and control groups in the range of movement of the waist, lateral bends of the torso, rotation of the hip joints, and forward bend of the torso (all figures denote average values). *The minus sign means that the subjects in the control group failed to touch the stool on which they were standing in the forward bending test, their fingertips coming no further down than 6.83 cm above the surface of the stool. The above table shows that the exercise group is superior to the control group in all the items tested. With most old people the range of joint movement markedly decreases with age. It is believed that this decreases elasticity in the muscles and muscle tendons, proliferation of the connective tissue in the muscles, etc. may also affect the movement of the spine. The fact that range of joint movement displayed by the exercise group had been found to be clearly superior to that of the control group is ample proof of the benefits derived from long years of Ba Gua Zhang practice. Age-related retrograde changes of the skeletal system are usually indicated by such symptoms as osteophyma (hyperosteogeny in the pre-vertebral part), osteoporosis in the pyramid, abnormality of the weight-bearing line in the acetabulum and abnormality of the caput femoris (deformity of the caput femoris, osteoporosis, osteophyma formation, etc). Osteophyma results from the degeneration of the intervertebral disc and the abnormal activity of the pyramid, which cause consistent over-stretch of the ligaments around the pyramid (the anterior and posterior longitudinal ligaments) and irritate the periosteum to which the ligaments are attached. Osteoporosis in the pyramid manifests itself in such symptoms as thinning of the bone cortex, rarefaction and thinning of the bony trabecula, and the decrease of bone density. All these lead to deformation and inflexibility of the joints. The change of the radian in the weight bearing line of the hip joint means there is deformity of the joint surface and may to a certain extent affect or damage the function of the joints. From the frontal and lateral X-ray photographs of the waists and hips of the subjects in the two groups, the average number of Ostephyma in the lumbar vertebrae has been found to be 12.174 in the exercise group and 16.857 in the control group. Osteoporosis in the lumbar vertebrae affects 17.8% of the persons in the exercise group, while the figure in the control group is as high as 49.3%. It is also noted that the transverse diameter of the femur (averaging 34.98 mm) and the thickness of the bone cortex (19.87 mm) in the exercise group are obviously better than the corresponding measurements taken of the control group (32.06 mm and 17.47 mm respectively). Osteoporosis of the femur and rarefaction of the bony trabecula affect only 40% of the persons in the exercise group, but no less than 60% of those in the control group. In practicing Ba Gua Zhang, the expansion and contraction of the skeletal muscles, the movement of the joints, and the constant change of the abdominal pressure brought about by rhythmic abdominal respiration, all contribute to the acceleration of the venous backflow. Moreover, many more capillaries are open during exercise, thus decreasing the peripheral resistance of the minor blood vessels. All this helps improve blood circulation of the blood and the nourishment of the cardiac muscle, thus resulting in a better function of the cardiovascular system. Electrocardiographic tests have detected abnormal ECG in 41.38% of the subjects in the exercise group and 65.520% of those in the control group. It has been reported that the abnormal ECG detectable rate for old people is 67.60%. By comparison, the rate of normal ECG in the exercise group is higher than that in the control group. The difference should be credited to the salubrious effects of Ba Gua Zhang. Ba Gua Zhang practice requires great concentration. Practitioners at a more advanced stage are even required to cultivate a sense of real fighting and an ability to apply their combative techniques according to changing circumstances. Exercising in this manner can help improve the flexibility of the nervous system. Besides, a Ba Gua Zhang performer has to walk round and round in circles, turning now to the right and now to the left as he changes his hand movements. In this way he keeps rotating his body on its vertical axis, which helps improve the function of the vestibular analyzer. Reaction Time 198.02 millisec. 230.4 millisec. Electro-mechanical Delay 64.19 millisec. 77.96 millisec. The degree of deviation displayed by the exercise group is smaller than that shown by the control group, especially when the eyes are closed. With the eyes closed, the use of vision for body balance is precluded so that the test concentrates on the function of the vestibular and muscular senses. The above-mentioned results of the test prove the beneficial effects of Ba Gua Zhang practice on the nervous system.